Fortunately that's not the only excuse I have, I also didn't know what car to review. I didn't feel like reviewing a brand new racer car, I wanted to review a car that has disappeared out of everybody's memory'''' Well I didn't find one that is compatible with beta 8+ so I decided to review Mr. Whippy's M5. After loading good old carlswood, I realised something; this is a conversion, so it would be nice too look at it before it was converted and after it was brought to racer. 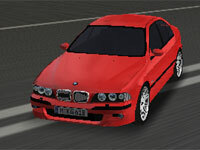 I left racer and downloaded the nfs4 version by Manutius, I installed nfs4 again and compared the bmw to it's the racer version. Well Mr. Whippy hasn't just converted it, he brought the mesh up to an higher level. Manutius got the basic shape right, but Whippy really added something extra. Ok, it's not perfect, you can see the scenery behind your car through the grill and the headlights are a bit too clear, but it's still very good compared too some other conversions. Let's move on to the interior, at least in this case a dark silhouette of something that looks like an interior. If this car had an proper interior, it would be even more fun to look at. Unfortunately it hasn't.. 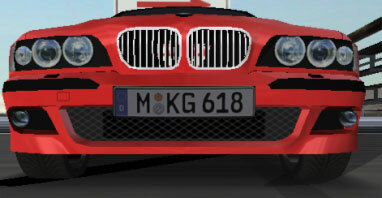 The m5's textures aren't remarkable or special, but at least it's properly retextured. There are enough conversion's around with crappy textures(cough mx-5 cough). Some shading would be nice however, although it's very easy to change the colour of your car with these kind of textures. I don't know if it's me or my controller, but I always seem to have the feeling that I'm coming into the corner too fast. I brake turn into the corner and I always seem to go to fast, which results in understeer or oversteer. When that happens I constantly hope for understeer. Why? Well understeer is at least controllable. I am a mouse driver (that's probably my problem) and it's very hard for me to recover out of oversteer. I read an article about the real M5 vs. the RS6. The article said that the biggest advantage of the M5 was his handing; the cars apatite for corners. Well the racer version is more an autobahn racer then a slalom master. Overall conclusion: it's a very good total package. Some points could use a bit of attention (interior), however if you look at the total package it's great.